How did I miss this? The new Ecler NUO4 (“nuo” / 4), reported in a skratchworx exclusive (with no information available anywhere else — Ecler’s DJ division included) is a mixer-control surface hybrid. From what I can get from the photos and limited description, the four knobs in the center are MIDI-assignable, with some additional MIDI triggers and an A/B tap button. 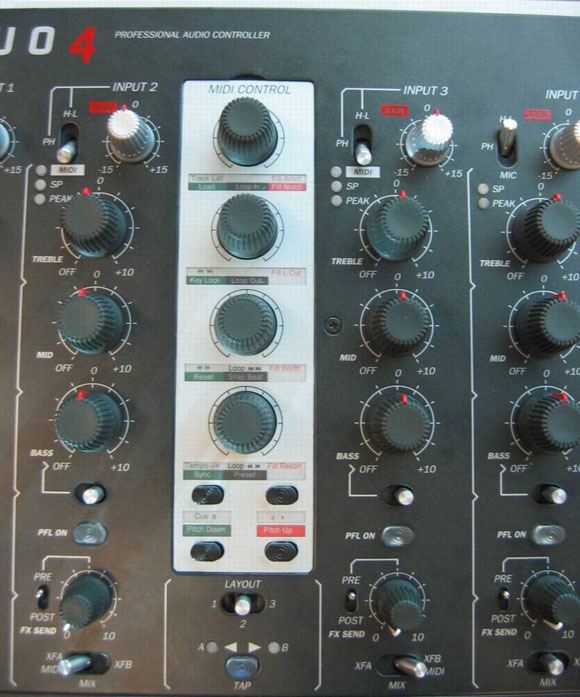 Not only that, but looking at some of the close-ups it appears all the effects controls and faders can be switched between analog hardware mode and MIDI mode. In other words, this is potentially really revolutionary, a perfect hybrid between analog mixer and MIDI control surface for Traktor/Live/Max/VJing/whatever. (Thanks to yet another anonymous Guest for getting the scoop in comments! Sign a name or something so I can give you credit, folks!) Needless to say, we’ll be watching for NUO4 updates. Speaking of credit where it’s due, major props to skratchworx, a terrific site devoted entirely to turntablists who have gotten all the major scoops from Musikmesse. Sorry I spelled your name with a “c” instead of a “k” in my first link, guys. Go check out their site, and soon you’ll wax poetic (sorry) just like me.